Peru is steeped in a rich archaeological heritage, with some of the most important sites lying in the coastal desert of the northern coast and in the southern Andean Highlands. The oldest remains of the Peruvian man were found by Pacaicasa, near Ayacucho, he lived around 18 to 20 thousand years BC. The men of Chilca in the southern Peruvian coast were the first farmers around 9000 BC. 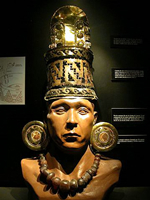 The most developed civilizations began with Chavin de Huantar in the present day Ancash area. Later the Paracas civilization in the southern coast of Peru had excellent weavers that left works that are admired all over the world. The Nazca culture left many material remains of their development and specially the famous and enigmatic Nazca Lines that can be fully appreciated only flying in an airplane. The Tiahuanaco civilization was developed in the Altiplano that is today shared by Peru and Bolivia.